Enjoy culinary holiday in the town of Voze in Liguria, Italy discovering many Ligurian local specialties. The parish church of San Pietro, which dates back to the 18th century, and was built together with the neighbouring cemetery, is worth a visit. Inside the church are many valuable paintings. The view of Voze town is breathtaking. Since the village lies about 200 Metres above sea level, one can have fantastic view of the coast from up there. Hiking and taking a walk can likewise be a wonderful experience. The merging of the mountains with the coast make every excursion a real experience. 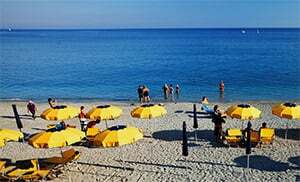 One can give oneself a treat of the finest ligurian delicacies in the numerous restaurants there, and thereby enjoy the breathtaking scenery of mountains and the sea. Voze was built in the Middle Ages. In the Middle Ages there were some conflicts over this village, as both the Marquise of Finale as well as the Republic of Noli Voze wanted to claim it as their own. Noli was at the time an ally of the Genoan Republic. With the advent of Napoleon’s rule, Voze became part of the first French Republic in 1805, then in 1815 it became part of the Sardinian kingdom, and in 1861 was integrated into the Italian kingdom. Voze is a village in the Savona province which lies in the Liguria region. Near Voze are several other villages like: Vezzi Portio (2.3 km), Noli (3 km) and Spotorno (4.7 km). When coming from Genoa, turn off from the highway exit to Spotorno then continue on the SP45 towards Voze.